What if your morning cup of coffee, brewed your favorite way, could transport your tired mind to a bustling Colombian street cafe - complete with cozy seating, background chatter, and authentic Colombian coffee beans? Java lovers searching for such a distinctive coffee experience can find it in the booming marketplace of Colombian coffee brands. Colombian coffee is renowned for its smoothness, sweetness, and unique flavor profile, pairing beautifully with both early mornings and midday breaks. Read on to learn about the unique history, taste, and production of Colombian coffee, and our top recommended Colombian coffee brands. Fact 1: The international appreciation for Colombian coffee beans has created a major tourist industry in Colombian. Travelers can visit local coffee farms, taste beans from different regions, and learn how the coffee moves from beans to bag. Fact 2: Over 2 million Colombians depend on their national coffee industry for income - that’s nearly 25% of the country’s rural population. ​Fact 3: There’s even a theme park for Colombian coffee beans: the National Coffee Park in Quindío, Colombia, where you can both learn about Colombian coffee and ride the infamous “La Broca” roller coaster. Fact 5: Colombian coffee is often associated with the fictional character Juan Valdez, a mustachioed Colombian coffee grower who has appeared in ads by the National Federation of Coffee Growers of Colombia since 1958. Based on popular lore, the birth of Colombian coffee can be traced to the early 1700s, when Jesuit missionaries first introduced coffee beans to South America. Little did the missionaries know how this introduction would impact hundreds of thousands of Colombians and coffee drinkers worldwide, leading up to the present day. Interestingly, a priest named Francisco Romero is believed to have influenced the rise of coffee production in northeast Colombia. After hearing the confessions of the parishioners in Salazar de las Palmas, Romero required coffee cultivation as penance: a strange but historically impactful request! From there, Colombian coffee beans continued to spread and thrive in the country’s ideal geography. Finally, in 1835, the first export of Colombian coffee beans - clocking in at a hearty 2500 pounds - sailed to the US. The export of Colombian coffee beans has increased exponentially over the years. Today, Colombia exports an average of 11.5 million bags per year - each weighing in at roughly 132 pounds. Currently, Colombia is the third largest exporter of coffee, trailing behind Vietnam at #2 and Brazil at #1. Although small, sustainable farms are a mainstay of coffee cultivation in Colombia, the quality and accessibility of Colombian coffee beans have been threatened in recent years by climate change and economic flux. The Global Coffee Crisis of 1989 led to a drastic fall in the price of coffee, followed by dramatic price fluctuations that created poverty and hunger among Colombian farmers and coffee businesses. Economic disturbances have been accompanied by climate changes, such as increases in temperature and rainfall. These shifts threaten the particular growing conditions necessary for Colombia’s signature coffee beans. Coffee rust, a brown fungus that destroys coffee plants is another pressing issue for Colombia’s coffee industry. Colombia’s arabica beans are especially vulnerable to the fungus, but scientists are trying to combat the rust with new hybrid coffee seeds. One such hybrid the Castillo was released successfully in 2005, but its hybrid nature raises concerns about the purity and quality of Castillo Colombian coffees. As of 2018, Colombian coffee workers are still fighting against environmental threats and are asking for better pay. International coffee players such as Starbucks and Nestle are being urged to support Colombian coffee farmers by raising wages and stabilizing the costs and demands of production on family farms. Where is the Colombian coffee industry today? Despite its historical setbacks and future challenges, the Colombian coffee industry remains a vital part of the country’s cultural landscape. If you visit a town in Colombia today, you will almost certainly have the opportunity to try tinto, the country’s standard coffee drink. Roughly translated to “inky water” in English, tinto is a thick, bitter brew made from the beans that are not good enough to export. Only recently has Colombia started to shift from tinto and begin to drink its own high-quality coffee. Now, modernized Colombian coffee houses are leading the charge in transforming the nation’s coffee culture. Preceding these coffee houses, the National Federation of Coffee Growers of Colombia, established in 1927, has long played an important role in protecting Colombian coffee farmers and their culture. Without this organization, the complexities of commercial exportation would likely make it impossible for you to enjoy a cup of Colombian coffee in your home today. Sweet, mild, and light, the flavor profile of Colombian coffee beans is a crowd-pleaser among coffee drinkers. Most Colombian coffee brands describe their beans as full-bodied and bright in acidity, with a mild flavor, citrusy or nutty undertones, and hints of chocolate, caramel, or brown sugar. Where is Colombian coffee grown? Although there are smatterings of other coffee farms in other regions of Colombia, two key areas - the Colombian Coffee Growing Axis, or the Coffee Triangle, and the Sierra Nevada de Santa Marta range - are prized for their geography and the tastes of their coffee. The Coffee Triangle describes the northwestern regions of Colombia where most of its coffee beans are grown. The triangle consists of three “departments”: Caldas, Quindío, and Risaralda. All three of these areas are renowned for the richness of their soils. In Risaralda, volcanic eruptions that occurred thousands of years ago - before coffee had even arrived - enriched the earth with ash and organic debris. In a nutshell (or a coffee bean): volcanic ash + high altitudes + adequate shade and rainfall = delicious Colombian coffee, happy farmers, and happy coffee drinkers. In addition to the Coffee Triangle, the Sierra Nevada de Santa Marta range in the southwest of Colombia is also home to a rich coffee history. These mountains are geographically perfect for coffee-making, with their high annual rainfall, adequate shade, and, of course, high elevation. The indigenous peoples who live here especially value the relationship between humans and nature. They rely on both their modern planting knowledge and spiritual traditions to produce their coffee beans. Coffee from the Sierra Nevada region is described as full-bodied and lower in acidity, with strong notes of dark chocolate, toasted almonds, and a pronounced aroma. Because there is only one harvest per year (as opposed to two in most other coffee-growing regions in Colombia), Sierra Nevada coffee is especially coveted. What Makes Each Region Taste Different? Although the taste differences between regions might seem insignificant to some coffee drinkers, slight changes in elevation and rainfall make a big difference for the best Colombian coffee brands and their sophisticated taste buds. The acidity of the coffee beans is a key variant between regions. In northern Colombia, where latitudes are lower and temperatures are higher, farms produce the lower-acidity, fuller-bodied coffee that other countries have grown to admire. Coffee comes in two main species, arabica and robusta. Arabica is the less bitter and overall tastier of two. Think of arabica as your favorite aunt, and robusta as your gruff but tolerable uncle. Colombia exclusively produces arabica beans. The harvesting of arabica beans in Colombia occurs between 210 and 224 days after the trees of the coffee plant bloom. The alteration between dry and wet seasons varies regionally in Colombia, and determines how frequently Colombian coffee growers can harvest and sell their product. What exactly does harvesting look like? For Colombian coffee, the standard harvest cycles run from September to December and from April to June. When the “coffee cherries” turn red, the fruit is officially ready to harvest. You can even sample the cherries, if you’d like - they’re sweet and flowery, mirroring the flavor of the coffee they produce. More of a visual person? Check out this video to see how Colombian coffee travels from the farm to the table. After the cherries have been harvested, the exterior skins and the sweet pulps of the fruits are separated. While the fruit is typically discarded in the process, there are some interesting coffee cherry teas on the market! The post-harvest process is called beneficio (translating to “benefit” or profit) in most Colombian countries. First, the dry beneficio: the cherries soak up the sun for several days, which adds sweetness to the coffee seed and other compounds that add to the complexity of the flavor. Then, the wet beneficio: This process is like a cold, refreshing bath for the coffee beans after sweltering in the sun for multiple days. Farmers depulp, ferment, wash, and dry the coffee bean - but if they work too slowly, they risk the possibility of fermenting the beans and creating a taste defect. . The beans are then “hulled” to release the green coffee from its parchment coating. Finally, the green coffee seeds are carefully selected based on size and appearance. The winning contestants undergo the industrial processes of roasting and sometimes grounding, but other regions - such as the traditional farms in the Sierra Nevada de Santa Marta range - strictly adhere to generations-old production techniques. Today, the processing of Colombian beans is often assisted by mechanical methods, particularly during the wet beneficio process. The ecological beneficio technology removes the fruit “mucilage” to reduce impurities, speeding up the traditional process and saving water. This Colombian coffee brand is a longstanding “Amazon’s Choice” for a reason. Cafe Don Pablo’s artisan-crafted coffee beans are known for their mild, sweet flavor, citrus notes, and smooth cocoa finish with a hint of walnut. 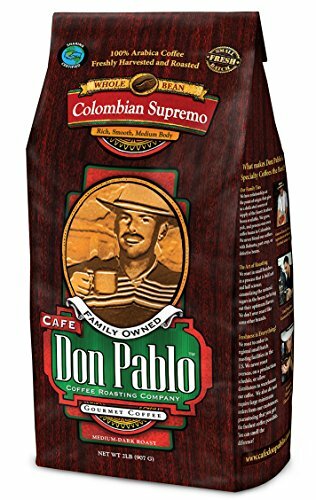 The medium-dark roast caramelizes just enough of the natural sugars while retaining a pleasant “roastiness.” Fans also appreciate Don Pablo’s affordability and consistency from bag to bag. Don Pablo rates its Colombian Supremo as a “6” in both body and richness on a 10-point scale, and describes the roast as smooth and low in acidity. For newcomers to Colombian coffee, the balanced taste and attention to detail exhibited by this company are ideal. Don Pablo also belongs to the Sharing Certified Program, which uses incentives and rewards rather than subsidies to encourage better labor conditions and coffee quality, sustainable agriculture, and environmentally-sound production. In addition to its full body, low acidity, and bold, balanced flavor, these medium dark roasted coffee beans are certified USDA Organic, fair trade, 100% chemical and pesticide free, and GMO free. 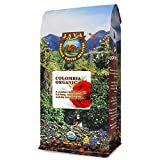 Java Planet also prides itself in being bird friendly: a unique twist on a seemingly traditional Colombian coffee brand. The brand has donated a portion of its proceeds to the Smithsonian Migratory Bird Center, and also gifted coffee (perhaps the best gift of all) to the Have a Heart Fundraiser for Florida Voices for Animals. Java Planet is highly committed to both its local community in Tampa, Florida and its international community, evidenced by its use of 100% certified organic Colombian beans. Ultimately, Java Planet offers an environmentally-aware and authentic Colombian coffee, with the roasting date printed on every bag. Not too strong and not too weak, this brew is described by many fans as just right: whether with cream, sugar, or simply on its own. The medium roast offers a pronounced flavor with a floral aroma, a full body, and a smooth finish. Interestingly, the brand describes the taste of this coffee as both “winey” and fruity: a welcome solution to your AM wine cravings. Jose’s believes that a beautiful cup of coffee shared with a friend is one of the greatest pleasures in life. The whole bean packaging of its Colombian coffee might encourage you to start an early morning ritual: wake up, grind your coffee, brew as desired, and share a steaming mug of coffee with a loved one. This brand is both an economic and delicious choice, particularly for students like myself. Personally, I cannot stand when grounds are left floating in my mug after I use my very cheap (college-priced!) French Press. Whether you use a French press, Aeropress, or some other gadget, the brand’s extra fine grind produces a clean, rich, and smooth cup, all while using up to 30% less coffee. 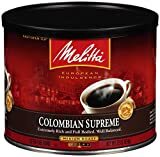 Melitta primarily sources its coffee beans from smaller family farms in Colombia, and crafts the beans into a dependable product that does not emphasize or “over-do” any one flavor. 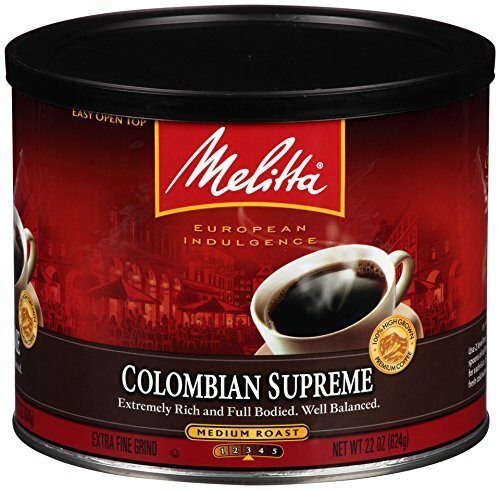 While this may not be as distinctively “nutty” or “fruity” as other Colombian coffee brands, Melitta is an extremely balanced and affordable option. One sip of this medium roast Colombian coffee offers a rich sensory experience. The warm aroma, robust flavor, and incredibly smooth mouthfeel make this brand a go-to for those who seek a classic Colombian coffee without too much personality. The brand’s coffees have been roasted the same way for over 100 years, providing both consistency in taste and affordability in its competitive pricing. The story behind New England Coffee actually begins in Greece, where the two Kaloyanides brothers were born. They immigrated to the U.S. in 1910 and began their coffee business in 1916. 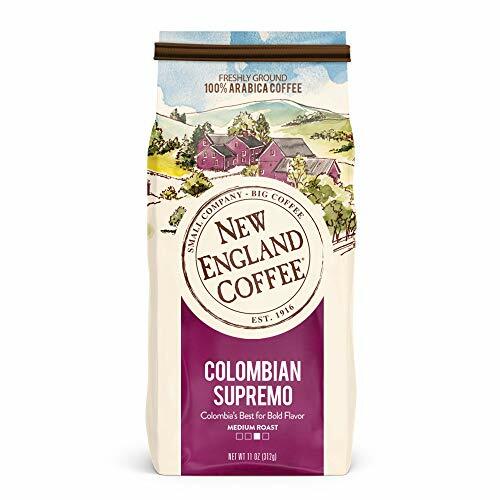 Since then, New England Coffee has grown to source high-quality beans from countries around the world: most importantly, Colombia! 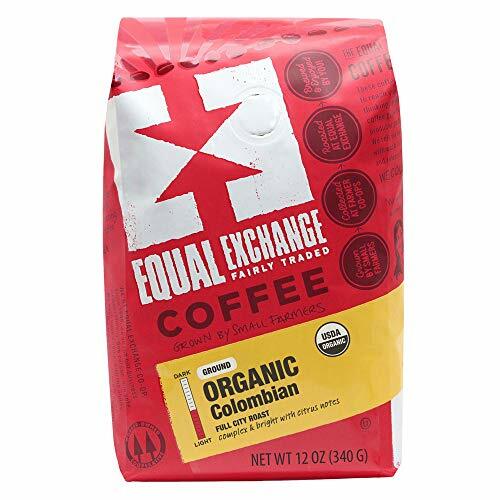 Equal Exchange’s Colombian coffee offers a complex and exciting taste experience, combining citrus notes, dried fig, chocolate, spice, & banana. Despite the variety of underlying flavors, the coffee is surprisingly mellow and expertly balanced. As a worker-owned cooperative, the brand ensures that all of its coffees are fairly traded with small family farmers. Most of the co-op's 3300 members are Embara Chambi indigenous people who live on the outskirts of Riosucio: this is a town in Caldas, Colombia, one of the three regions of the Coffee Triangle. Female and youth participation and leadership are highly valued in the co-op. Devoted customers of Equal Exchange’s Colombian coffee praise it for its supreme freshness, Fair Trade association, organic certification, and excellent value. This medium-roasted coffee is cultivated exclusively at high-altitude in Colombia’s volcanic soils. The coffee is accentuated by winey notes and a rich, elegant aroma with a lingering sweet finish, and tastes just as good as it smells. 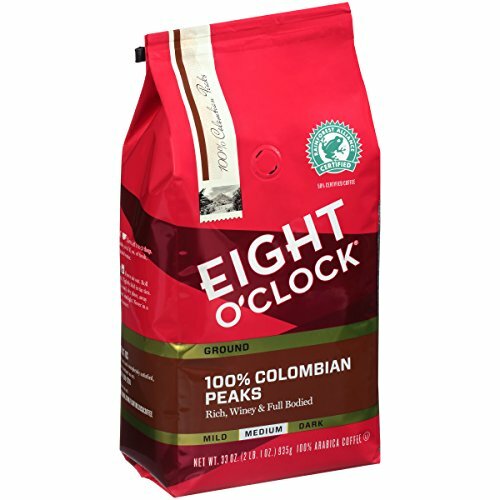 Eight O’Clock got its start in 1859, and reigned supreme as the #1 U.S. coffee brand by the 1930s. The century and a half that the brand has spent refining their craft is made clear by their Colombian coffee, given the recognizable taste and specific geography behind a “true” Colombian. Fans rave about the affordability and authenticity of this brand, which achieves the citrusy nuance of a classic Colombian coffee. 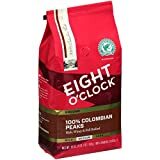 For daily coffee drinkers, Eight O’Clock is a dependable morning go-to and a desirable alternative to notoriously expensive brands. Finally, a Colombian coffee brand toasted and packed in Colombia! 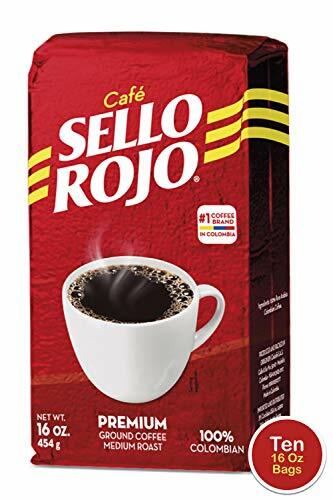 Described as “Colombia’s favorite coffee”, Sello Rojo has become a staple in the country of coffee since the brand’s inception in 1933. Sello Rojo’s beans are roasted, grounded and packed at the source, creating a highly consistent and authentic cup of Colombian coffee. The highly versatile beverage can be served with milk, cream, sugar, or black, hot or iced, without altering its defining taste and richness. The medium roast yields a balanced body with notes of sweetness and low acidity. Cafe Sello Rojo intentionally maintains a low inventory to guarantee freshness in every purchase. The brand’s attention to detail extends to the actual growth and production of their coffee beans, which are handpicked in the Andes green mountains. 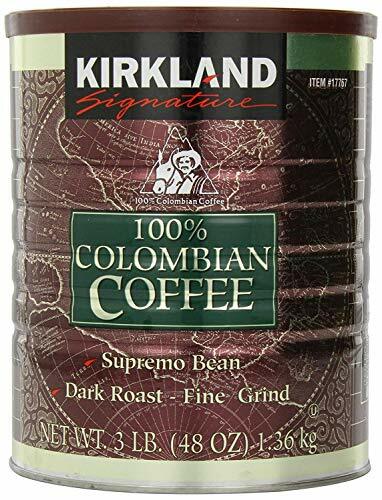 For savvy shoppers who like to purchase in bulk, Kirkland Signature’s Colombian coffee provides both quantity and quality. This fine grind, dark roast coffee is smooth, rich, and deliciously dark without tasting bitter or burnt. 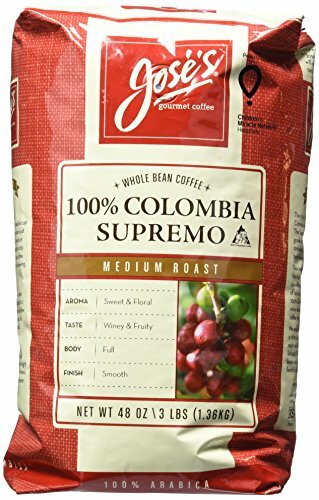 The 3-pound tub can easily sustain a family (or an office) of daily drinkers of Colombian coffee. And, for peace of mind: if you are not satisfied with a Kirkland brand purchase, you can return the product through snail-mail or to your local Costco for a full refund. The standard espresso is a reliable way to enjoy a cup of Joe by one our favorite Colombian coffee brands. Your kitchen espresso machine can produce an aromatic, full-bodied pot of Colombian coffee. Because the grounds are fully immersed in hot water prior to being “pressed”, the Aeropress works especially well for Colombian coffee beans, allowing their characteristic undertones of chocolate and citrus to fully emerge. Colombian coffee brands with lighter roasts tend to produce coffees that are more complex in taste and fuller-bodies. If you opt for a lightly roasted Colombian coffee, the signature floral and citrus notes should be clearer to your taste buds. Medium roasts are often described as the most balanced: not as intensely citrusy or floral as a lighter-roast Colombian coffee, and might have a hint of caramelization. For all you chocolate lovers: dark roasts veer toward the extreme end of the chocolaty spectrum, so a dark roast Colombian coffee may be your best choice. What is the difference between Colombian coffee and regular coffee? Colombian coffee is lower in acidity and caffeine, sweeter, and more complex in flavor (think: chocolate, citrus, and flowery undertones) than regular coffee. Is Colombian coffee more acidic? Due to the wet beneficio process involved in Colombian coffee production, which results in “washed arabica” beans, the coffee is less acidic and purer in flavor than most varieties. However, acidities vary regionally, and some Colombian coffee brands will note subjective acidity levels on their packaging. Is Colombian Coffee better than arabica? Colombian coffee is simply a variety of arabica beans, so one is not necessarily “better” than the other. Taste-wise, arabica is often prized over robusta beans, which are hardier crops but tend to produce more bitter coffee. 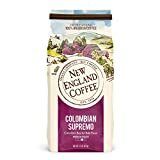 Is Colombian coffee high in caffeine? The arabica beans used in Colombian coffee contain about half the amount of caffeine found in robusta beans, leaving you focused rather than jittery. Is Colombian coffee good for you? Like most coffee, the relative “healthiness” of Colombian coffee largely depends on what you add (or don’t add) to it. On its own, the natural sweetness of Colombian coffee makes for a comforting, calming beverage, with the added benefits of caffeine and free-radical-fighting antioxidants. If you, like us, have a sweet tooth, check out these healthy ways to enhance the sweetness of your coffee. ​What exactly does “Fair Trade” and GMO-free mean? If you see “Fair Trade” on the packaging of your Colombian coffee beans, it means that the brand is committed to ensuring that farmers receive fair prices and credit. Fair Trade organizes farming groups that receive a guaranteed minimum price, or the market price if it’s higher. Fundamentally, it provides fair labor conditions and prohibits child and slave labor. GMOs - Genetically - are somewhat controversial. Although some brands strive to create non-GMO products, research has consistently shown that there is no harm in eating or drinking GMOs. For especially conscious consumers, it is helpful to check out the websites and missions of potential purchases to make your decisions. ​What is the difference between Supremo and Excelso beans in Colombian coffee brands? The 9 brands we reviewed use Supremo beans, which are slightly bigger than the already large Excelso beans. In general, the larger the coffee bean, the better the flavor, although there are exceptions to the rule. These top Colombian coffee brands are well-loved for a reason. Although our top pick, Cafe Don Pablo, offers an ideal mix of deliciousness, affordability, and social awareness, others may rise to the top of your list as you test different brands (and your coffee palate!). Ultimately, whether served as a reliable morning sidekick, an afternoon pick-me-up, or even a late-night energy kick, Colombian coffee is consistently delicious: a balanced, smooth, and slightly sweet brew that can be enjoyed any time, anywhere, and in any way. Which of our recommended Colombian coffee brands speaks to you the most? Follow our suggestions and hit the web to select one (or all) of our top picks! Armed with these facts, tips, and reviews of top-notch brands, you could be enjoying a fresh cup of authentic Colombian coffee by tomorrow morning. Deborah Woodson is sub-editor of A Great Coffee. She is a graduate of the University of Georgia (UGA), with a B.A. in Journalism/Public Relations and a certificate in New Media. She is experienced in creating news articles, blog articles, marketing emails, press releases, and social media content across a variety of platforms.